Karen is a pioneer in the horse industry with her unique training method, teaching style, and business model. She created a new niche by combining the sport of dressage with natural horsemanship. Her system is taught around the world in live clinics as well as virtual formats. Karen empowers students to progress with their horses with more confidence and fun. Karen’s book, Dressage Naturally is published in English, German, and Polish. She lives in Ocala, Florida where she divides her time between running her business and playing with her horses. 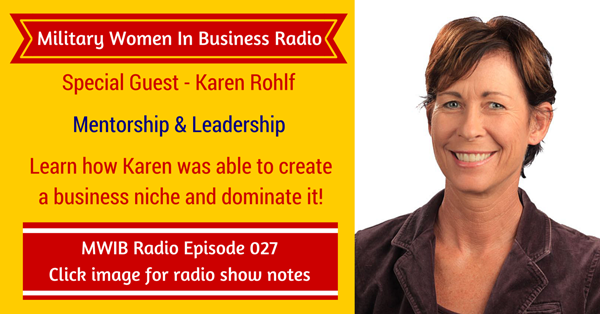 Click to tweet on Twitter: Karen Rohlf shares how she created her own business niche and dominated it! Karen created a business niche where people in her own industry didn’t know what it was! This was really difficult because there were no footsteps to follow. The challenge for Karen was to clearly communicate what she did and the transformation that she offered. Knowing how to clearly communicate what she did in her business made it easy to market this new found business niche. The more she listened to her clients and what they were getting out of it, the more words she had to describe what she did that would land with anyone seeking her services. Even though Karen created her own business niche, she still needed help. It’s very easy to be self-focused and self-centered and think that “you’re the only one who knows how to do this.” The truth is that every business needs a boost and you need someone to help you. You don’t have to do it all by yourself because you’re the expert. No one may have the same big picture as you but there are a lot of people out there that have the little bits and pieces that you can put together in your own way, which improves the bigger picture. It’s important to know what you need in your business. When you take the time to pause and focus, you realize that it boils down to one core thing. You should seek out a mentor who has a proven track record and results who can help you with this missing piece in your business. They don’t have to be in your industry or in the same business as you. You also have to trust them. When you trust them, you’re going to be more open-minded and allow the information to sink in and execute the game plan. It’s also important that you enjoy the way they deliver their information and their style. Special thanks to Karen for joining me this week. Until next time!